Every year it’s the same story in Chiang Mai and Northern Thailand: as the cool season draws to an end around late February or early March, the air quality quickly takes a turn for the worse. Yes, the “smoky season”—otherwise known as Chiang Mai’s “burning season”—is back again. If you’re a new arrival to the city, you might have many questions: “What causes the smoke?”, “How bad does it get?”, “How long does it last?”, “Should I go somewhere else?”, etc. When is the smoky season in Chiang Mai? The smoky season in Northern Thailand and the surrounding parts of Southeast Asia generally occurs during the months of February, March, and April. The exact timing and severity of the haze is different every year because it is dependent on human activity and the weather. The rainy season in this region is typically over by November, and so the air can start to get more hazy as early as December. It doesn’t usually become problematic, though, until late February or early March. On the tail end, the haze doesn’t fully clear until the burning stops and rains come to wash the pollution out of the sky. The real start of the rainy season isn’t until June, but there is usually enough rain in May to clear things up considerably. Hot season flash-storms in March and April can also help provide temporary relief for a couple days. The smoky season consistently reaches it’s peak in the second half of March, and the air is usually much improved after the mid-April Songkran holiday. But there have been years where the hazy air has lingered on well into May. The air in Chiang Mai is quite good for about ten months of the year. The other two, however, can frankly be quite terrible. 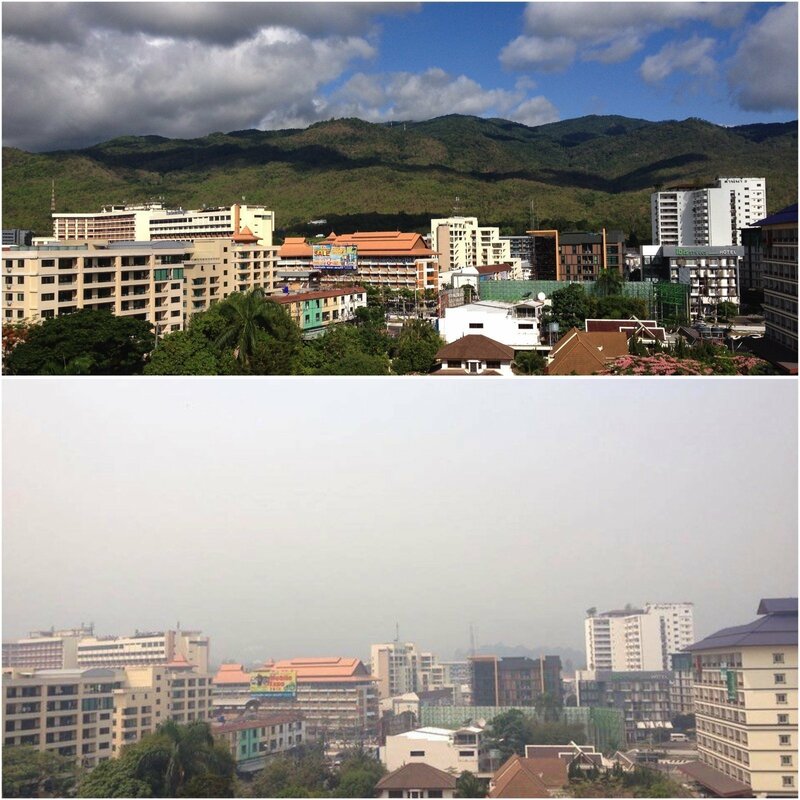 Just compare the two photos below of Doi Suthep taken from the same vantage point—one during the rainy season and the other at the height of burning season smog. What is the cause of the air pollution? Smoky season coincides with the tail end of the yearly dry season. By the time February and March roll around, there hasn’t been any significant rainfall in the region for several months. The forests of Northern Thailand are covered with dry leaves, and wildfires can spread quickly once there is a naturally occurring or accidental spark. There are also many man-made forest fires at this time of year. Some are set to clear land for planting corn and other cash crops on mountain slopes. Some are set to clear underbrush in order to encourage the growth of rare, prized mushrooms. Others are set to trap wild boar and other game animals. Down in the valleys, farmers burn the rice straw and corn stalks leftover from the previous harvests in preparation for the next planting. The mountainous terrain of Northern Thailand causes the smoky air to stay trapped in the valleys and gradually increase in pollution levels as the dry season progresses. The bordering areas of Myanmar and Laos face the same problem. They have similar terrain and similar human and natural causes that add to the total air pollution level in the region. Although sugar cane is not extensively grown in the North, the practice of burning sugar cane fields in Central and Northeast Thailand and in Cambodia also contributes significantly to the region’s pollution woes. How bad is the air during Chiang Mai’s burning season? The severity of the pollution problem can vary greatly from year-to-year and day-to-day within any single year. 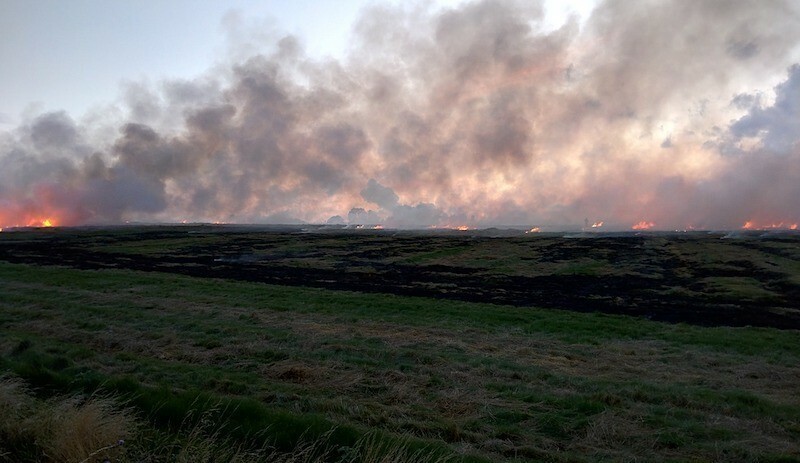 A large forest fire or crop-burning can spike the pollution level overnight, while a strong rainstorm or shift in wind currents can clear much of the dust from the air just as quickly. The best way to monitor pollution levels is to install the AirVisual app on your phone. Their huge user base allows them to collect an incredible number of live Air Quality Index (AQI) readings from all over the globe. My favorite feature of the app is the AirVisual Earth global map, which shows current wind patterns over color-coded AQI regions. It really helps you visualize just how stagnant the air in Northern Thailand can get at this time of year compared to the coastal areas. 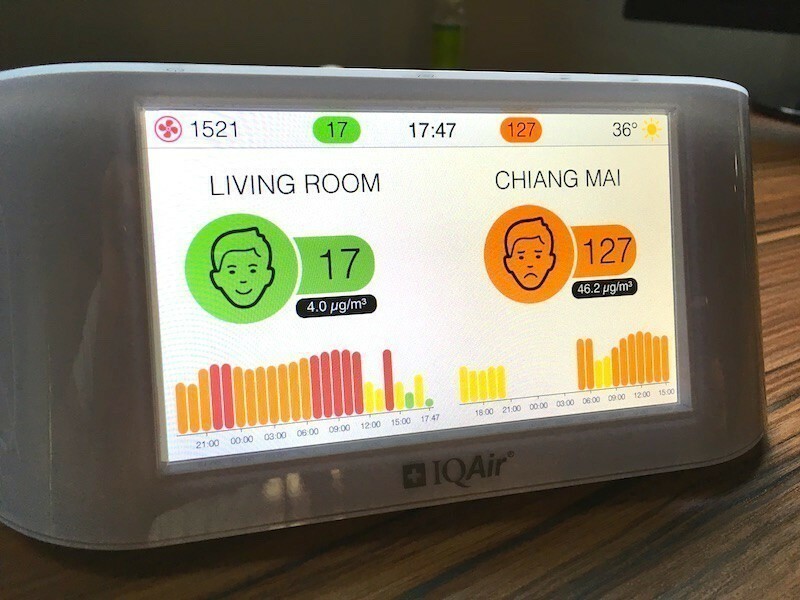 You can also check real-time AQI readings for Chiang Mai at aqicn.org or chiangmaiair.org. During the month of March, AQI levels in Chiang Mai regularly fall in the 150-200 “Unhealthy” range in which “Everyone may begin to experience health effects; members of sensitive groups may experience more serious health effects”. At “Unhealthy” levels, AQICN recommends “Active children and adults, and people with respiratory disease, such as asthma, should avoid prolonged outdoor exertion; everyone else, especially children, should limit prolonged outdoor exertion”. When the AQI spikes to 300+ the recommendation changes to “Everyone should avoid all outdoor exertion”. 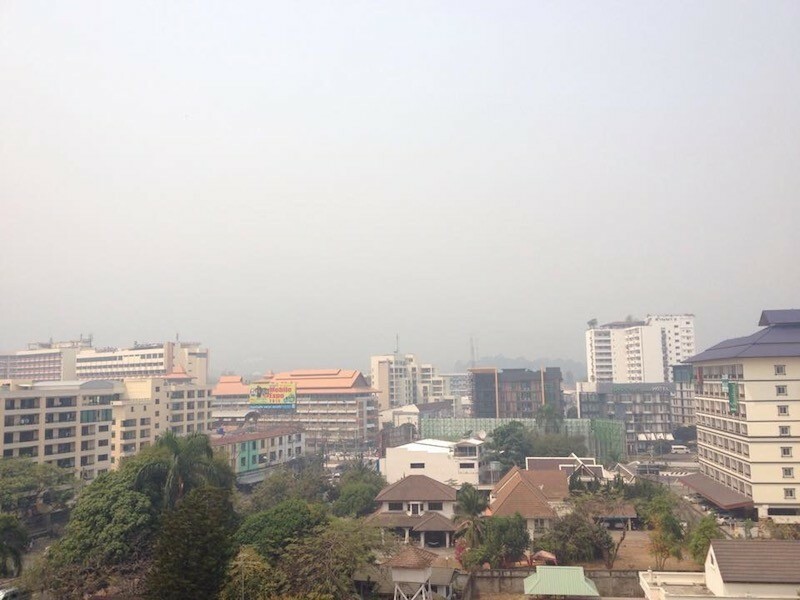 In late March 2019, there were several days where the recorded AQI levels from sensors in Chiang Mai and surrounding areas peaked above 600. At this level the air looks like a thick brownish-gray fog and stings the nose with a burnt odor. Air quality tends to be worse in the mornings. Fires are often set in forests at night under the cover of darkness, and overnight cool temperatures make the polluted air heavier and sink down into the valleys. In the afternoons, the midday sun can heat up the air to “burn off” some of the smog for a slight improvement. Is the burning season in Chiang Mai really that bad? You may encounter a few strongly-opinionated members of the expat community on social media who claim to be completely unaffected by the smog and belittle anyone who believes it to be a serious health hazard. For your own benefit, don’t listen to these stubborn folk and take the necessary steps to protect your short-term and long-term health. The smoke is especially dangerous for young children, the elderly, and anyone who has ever suffered from asthma symptoms. Hospital visits spike at this time every year, as people complain of sore throats, itchy eyes, coughing, sneezing, chest pain, and shortness of breath. Longterm, there is some evidence that yearly exposure to seasonal smog doubles the lung cancer risk among Chiang Mai’s residents. The smoke has been thick enough in the past to cause cancellation of flights scheduled to arrive at Chiang Mai International Airport and other regional airports due to a lack of visibility. If the smog gets thick enough to hide runways and entire mountains from view, just think about what that’s doing to the inside of your body. Should you leave town during the smoky season? I always do—at least for the worst few weeks of it. Once I can no longer see the mountain clearly from the center of town, I take it as a signal to head down south. Obviously, not everyone is in a position to leave Chiang Mai for an extended period of time. If you’re involved in location-independent work, however, I think it makes little sense to stay in town and “tough it out” when you could be breathing fresh air elsewhere. Where are the best places in Thailand to go during burning season? Don’t make the mistake of thinking that just getting out of the city will lead to cleaner air. Much of the countryside in the northern region actually has higher air pollution levels than Chiang Mai. This is because most of the forest fires burn in the mountains. For cleaner air, you need to head down south to the coastal regions, but not all are created equally. The coastal areas on the Eastern Seaboard such as Pattaya and Rayong can still be affected by pollution blowing down from nearby industrial and agricultural regions. Bangkok, though near the Gulf of Thailand, also has it’s own smog problems. The cleanest air at this time of year will be found on the southern peninsula and nearby islands. Some popular locations to escape the smog include Phuket, Krabi, Koh Lanta, Koh Samui, and Koh Phangan. The only real downside is that you’ll be paying tourist prices for food and accommodation at all of these beach destinations. Koh Lanta, in particular, seems to be one of the most popular smoky season escape destinations for much of Chiang Mai’s digital nomad crowd. For Iglu employees, Phuket is another place to consider, with our Phuket office a good workplace option. How can you protect your health if you stay in Chiang Mai? First, regarding outdoor activities, it is rather foolish to engage in jogging, cycling, and other strenuous physical activity outdoors during the smoky season. In particular, outdoor sports should be avoided on the days when the AQI is over 150. Aside from sporting activities, it’s a good idea to limit the amount of time you spend outdoors in general. When indoors, keep the windows shut and run the air conditioning instead. You will see many local people wearing standard surgical masks during the smoky season. These are, however, mostly useless for filtering out the small pollution particles of 2.5 microns in diameter that can lodge deep inside the lungs and cause the most health problems. You need to get masks labeled “N95”, which are able to filter out 95% of the airborne particles measuring 0.3 microns and up. Many of the pharmacies in town don’t sell these higher quality masks. One place that I’ve usually been able to find them is at the large branch of Pharma Choice on Suthep Road located across the street from Suan Dok Hospital. There is also a 3M Store located on Wulai Road (Saturday walking street) where these masks are sold. At times it can be difficult to find any N95 masks in the entire city, even in the above mentioned stores. Rising smog levels in Bangkok in January 2019 got to be so bad as to force schools to close. Due to either the increased media attention or to supplies being rerouted to the nation’s choked capital, N95 masks were nowhere to be found in Chiang Mai for several weeks. On the plus side, the demand for good quality N95 masks has led to them becoming more widely available. It is now easier to find them with some supermarkets and convenience stores carrying them. But you still never know when there will be a shortage. To avoid this problem, it’s a good idea to stock up on some well ahead of time. 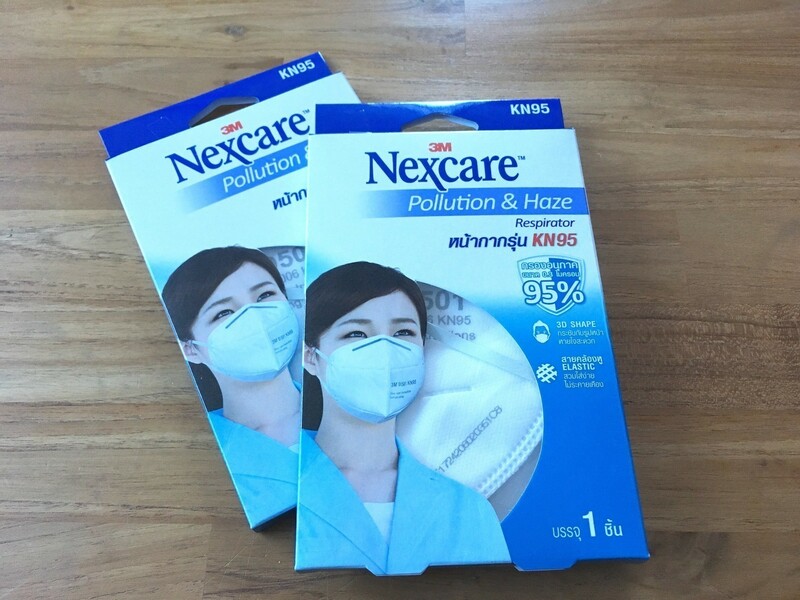 Another option is to check Thailand’s biggest online shopping site, Lazada, to see if N95 masks are available there. To keep the air within your home free of smog particles, the first thing you should do is keep the windows and doors shut on smoggy days. Run the air conditioner instead, even if it’s not that hot outside. Make sure to clean the filters in your air conditioner. Not only will it help to keep the air clean, but you should already be doing this regularly to help the air conditioner run efficiently. Additionally, you can purchase special filter material called Filtrete™ at the 3M Store to make your regular air conditioner units effective at filtering out some of the micro-particles. 3M’s Filtrete™ is also carried by HomePro. If both of these locations are out of stock, you can try checking Lazada to order some online. The next step that you can take is to purchase a home air purifier. These are available at large electric appliance stores such as Siam TV and home improvement stores such as HomePro. Small air purifiers start at around THB 5,000. A very popular model is the Xiaomi Mi 2S Air Purifier. I recently acquired one for my condo and highly recommend it for anybody spending part of the burning season in Chiang Mai. This model has a nice display showing the current PM2.5 reading. On the day I got it, the AQI outside was about 220, which translates to around a PM2.5 reading of 170 (You can convert between AQI and PM2.5 count at this website). When I started it up, the reading was “63”, which indicated that the AQI inside my condo with the windows shut tight and air conditioner running was still an “unhealthy” 155—yikes! 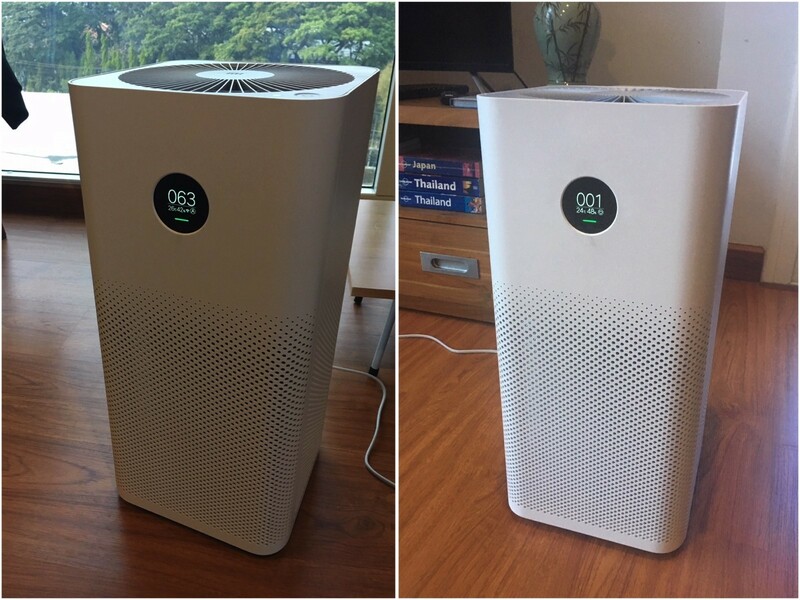 Fortunately, with the room sealed effectively, the Mi 2S air purifier was able to get the PM2.5 count reading all the way down to “1” for an indoor AQI of just 4. As you can see, an air purifier can make a huge difference in the quality of your air—at least for a small space such as a studio apartment or bedroom. If you can’t find any shops in town carrying this model, you can check Lazada as well. The only reason I was able to get the indoor air purified so well was that I effectively sealed off my condo from bad air. Doors and windows can easily have large gaps and cracks that allow smoky air to slip in. Transparent tape or masking tape can be used around door frames and windows to make a barrier keeping bad air out. If there is a sizable gap at the bottom of a door, you could also plug it up with a rolled-up towel. The small downside to sealing off your living area so well is that the CO2 level inside will rise. So you may wish to let fresh air in from time to time when the pollution levels are more moderate. How effective are indoor air purification methods? At Iglu’s HQ in Chiang Mai, we recently installed Filtrete™ in the air conditioners for all the main working areas. We also have several air purifiers throughout the building. After taking these measures, we were able to get the indoor AQI reading down to under 20 on a day when it was 120+ outdoors. However, to keep the air this clean requires some discipline. When somebody leaves a door open, even for a minute, it will introduce a significant amount of polluted air into the environment. But I heard there won’t be any smoke this year because of a burning ban? If you believe this, then I’ve got a lovely seaside resort in Chiang Rai I’d love to sell to you. In all seriousness though, I’m always hopeful that the situation will improve. Every year there is a lot of talk, but I’ve seen no indication in the past 15+ years of any real change to the human behavior that causes the smoke pollution. Burning bans never seem to be enforced, and government officials like to spend all their effort on ineffective strategies such as spraying water in the air, rather than tackling the root cause of the problem. While it’s good to be optimistic, it’s even better to be realistic and make plans to deal with the pollution here or escape for several weeks to somewhere more breathable.